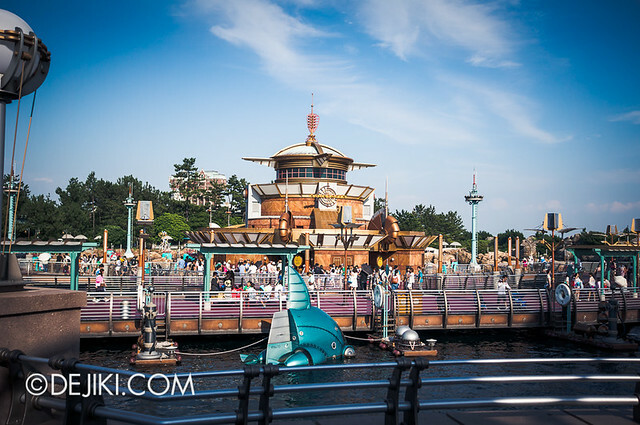 Heralded as the marina of the future, Port Discovery is a futuristic port at Tokyo DisneySea. 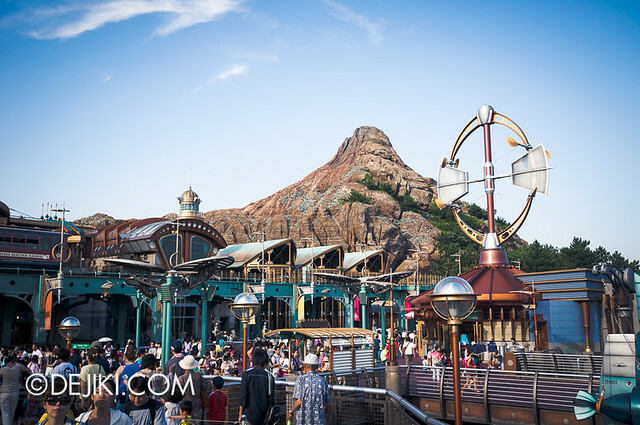 Unlike the other exotic destinations at Tokyo DisneySea, Port Discovery has a very metallic look – bright gold and teal panels dress the port, creating an imaginative future that is flourishing with technological innovations and explorations. 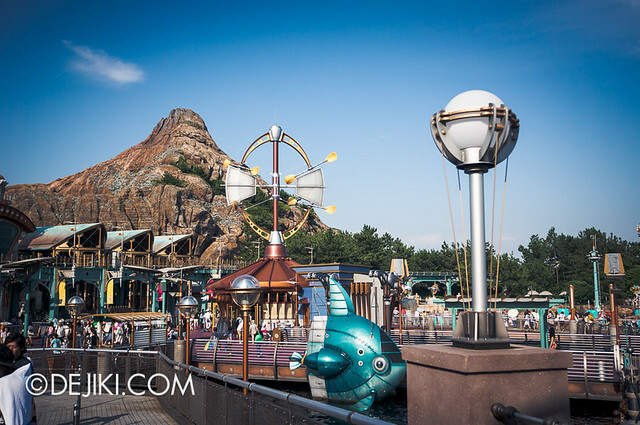 The smallest themed area in Tokyo DisneySea is home to three attractions – Aquatopia, StormRider and DisneySea Electric Railway. 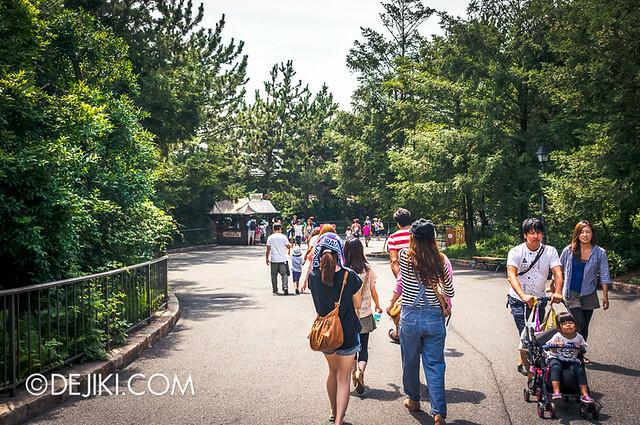 Walking from Mediterranean Harbor – peaceful transit through a deeply forested path. 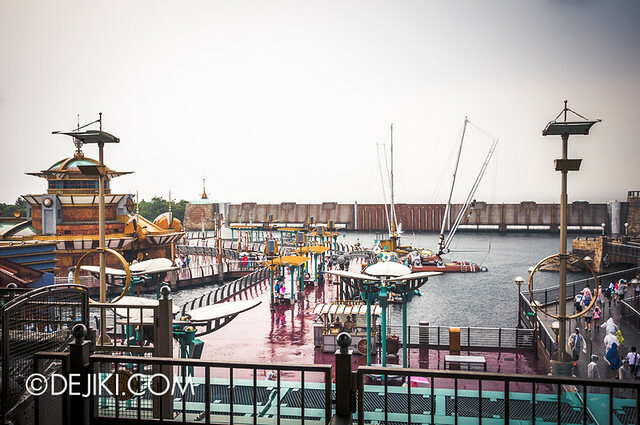 Welcome to Port Discovery. First sights after walking under the railway. 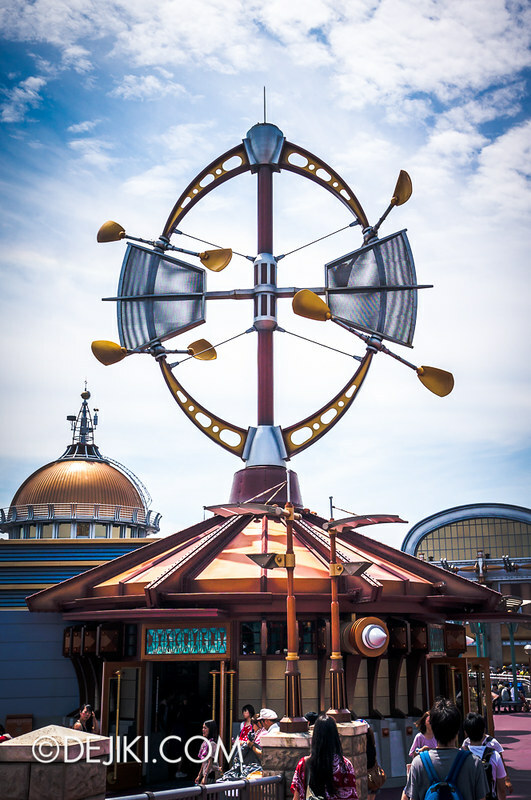 This gigantic Wind Machine is one of the most eye-catching structures in the park. It spins rather dramatically, some parts moving independently from the rest. 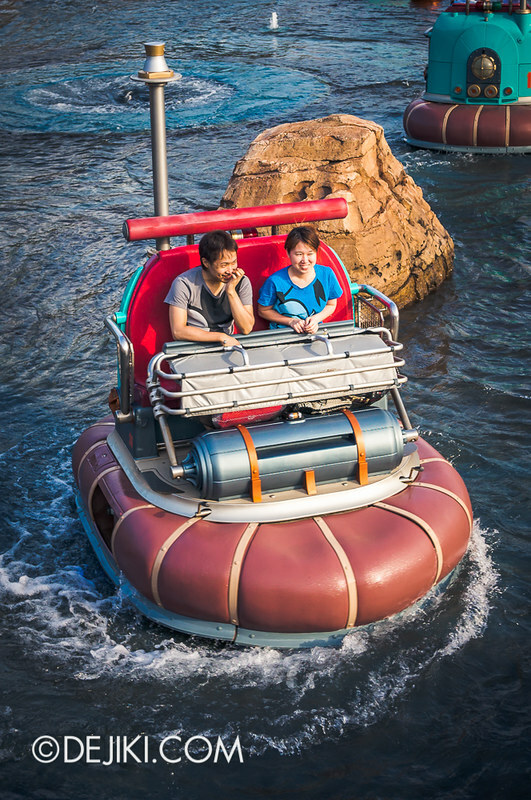 StormRider is a motion simulator ride about using weather-shifting technologies to diffuse a storm. Guests enter the Center for Weather Control for a briefing about a great storm. The StormRiders are able to diffuse the storm using a missile called FUSE. 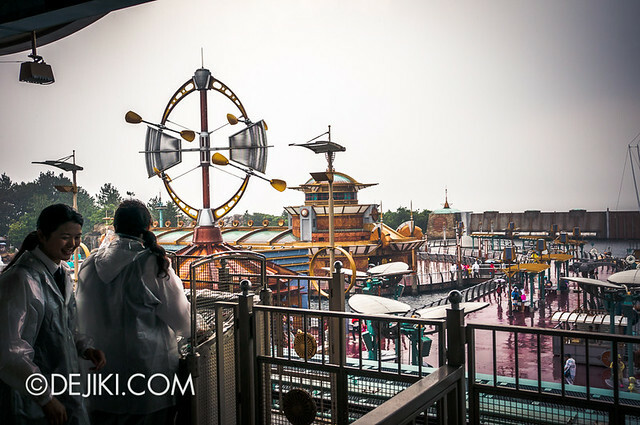 After a dramatic pre-show by a cast member, guests are led into two different StormRiders. The ride was pretty neat as it integrates some “4D” effects that weren’t actually annoying and helped with the experience. There are some surprising touches, including a “drizzling” scene and “cabin changes” which I won’t spoil here. I felt that they were much better than implementing 3D glasses (and having all the goofy effects). Motion-wise, it felt rather realistic when the ride simulated turbulence (reminded me very well of the flight to Japan). The projection technology is a bit dated though – there is some amount of flickering and unevenly lit sections. This is what happens after you go on Star Tours: The Adventure Continues. 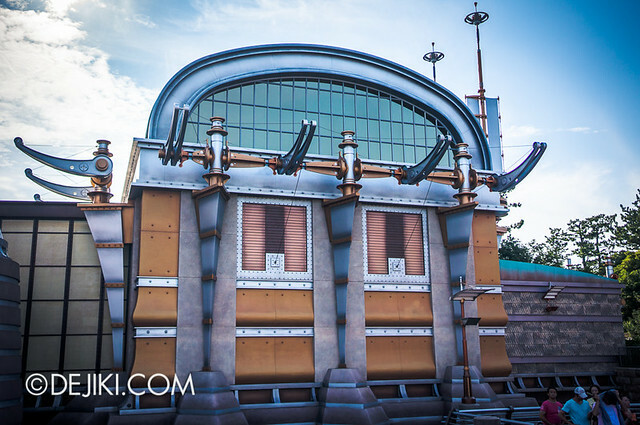 What I really like about the design of this attraction is how the ride buildings do not show that two different motion simulator cabins were built. The building facades are asymmetrical (or totally different) when viewed from outside. 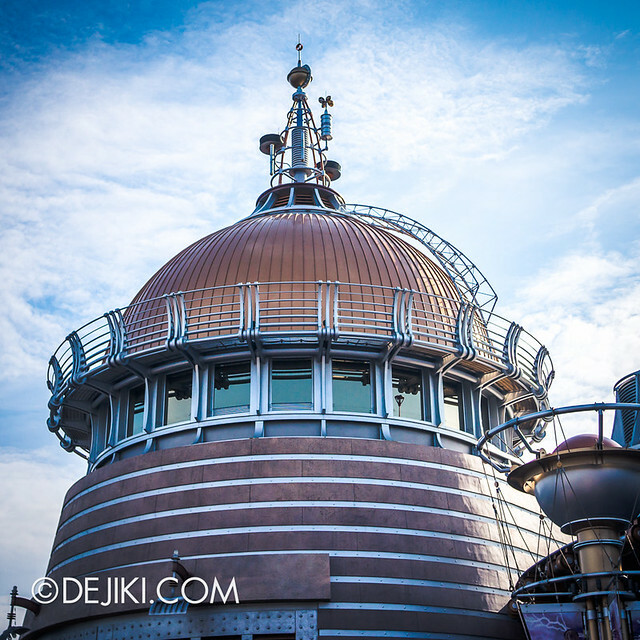 Mount Prometheus, blending gently with the vegetation. Mr. Incredible. 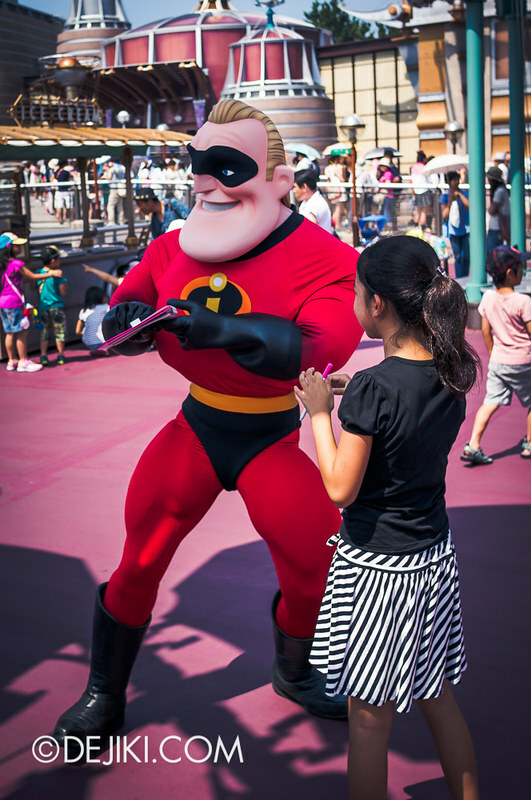 I’ve always wondered which characters would appear in Port Discovery (apart from the standard Mickey & Friends – they’re almost in every area of the park with matching outfits). 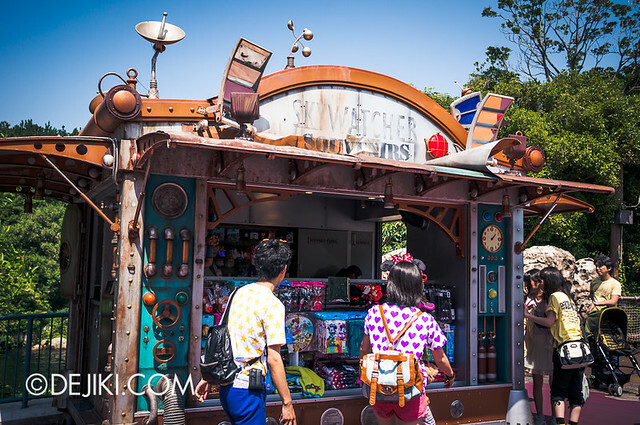 If you walk towards Lost River Delta from Port Discovery, this rugged stall – Skywatcher Souvenirs – makes the transition somewhat easier. 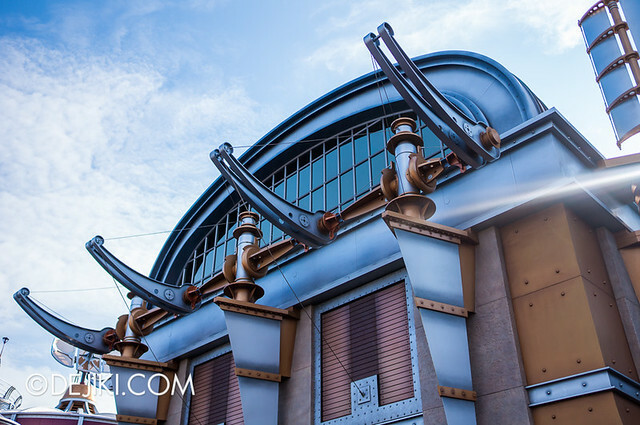 Another look at Mount Prometheus again at a different time of the day. Aquatopia is the another attraction here. 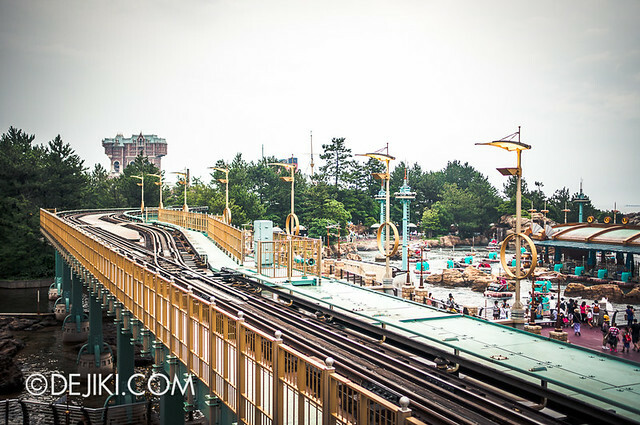 It’s a trackless water ride. 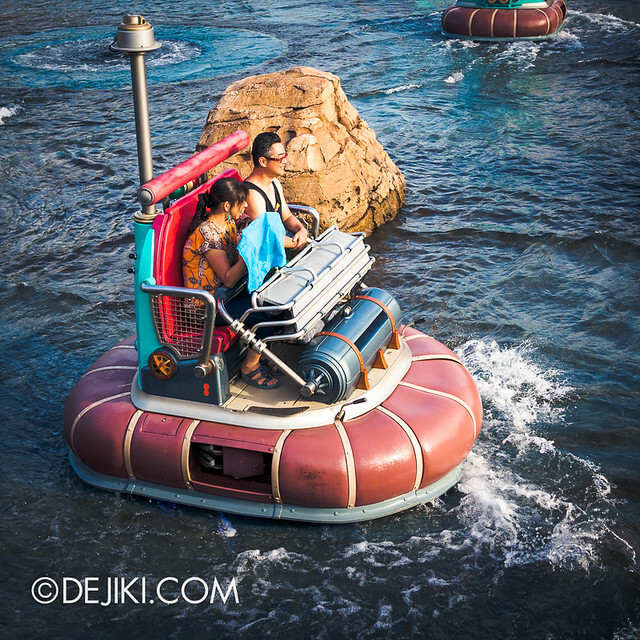 Two guests can board a “hovercraft” and have a peaceful (or not) journey on water. 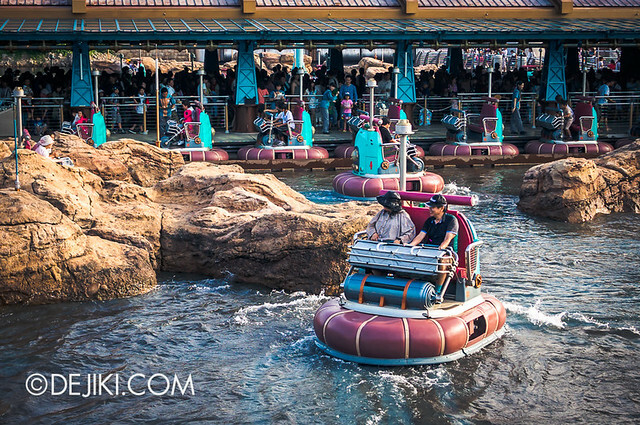 During summer season, Aquatopia has a “wet” experience – brave riders are at mercy of waterfalls, water jets and other surprises. 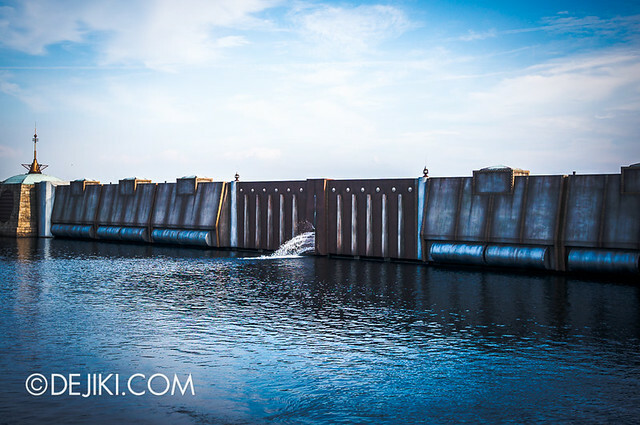 Water (from Tokyo Bay) leaking through the gates. 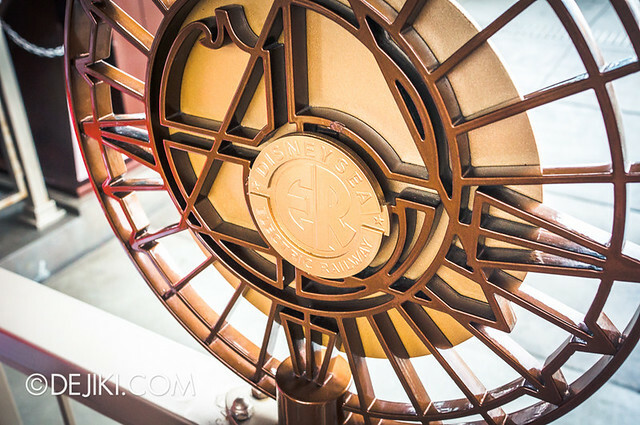 I’ve always found this little detail, added by the park designers, to be very clever. 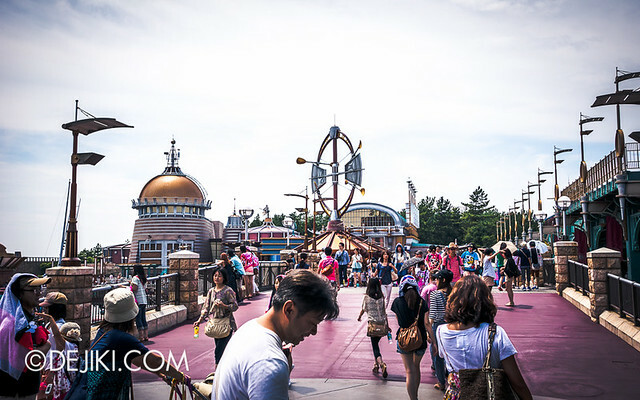 On a clear day you will be able to look at the sea beyond the gates and everything just looks… correct. 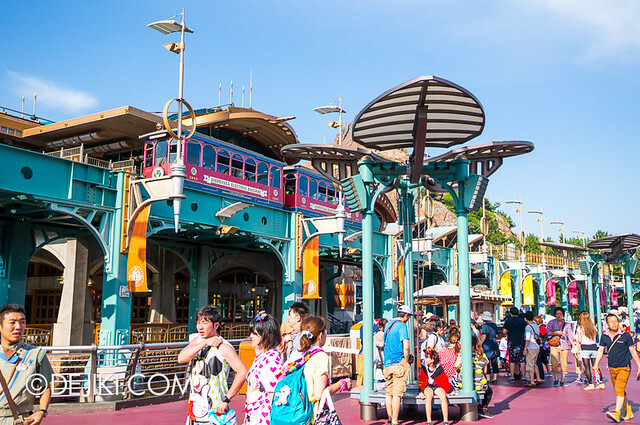 DisneySea Electric Railway is a transport ride which we’ve already seen at American Waterfront. 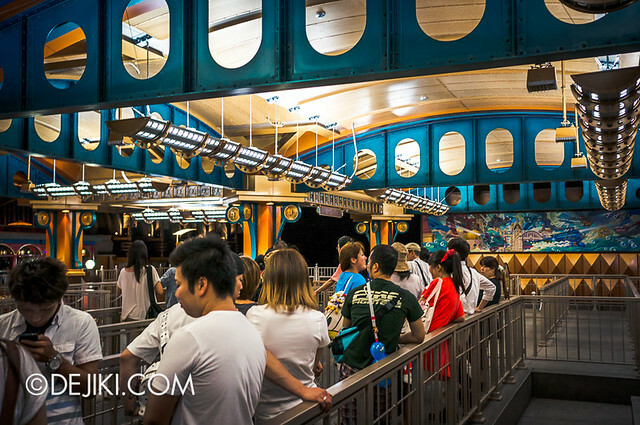 While both stations share the same train, the stations are entirely different. Heavy use of fancy lights and all here. 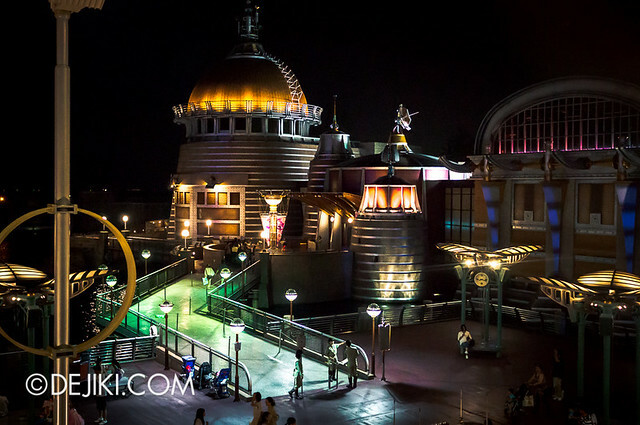 A glimpse of how Port Discovery looks like at night. I’d have to return and photograph the entire area (with a small tripod, perhaps). Back again on another rainy afternoon. 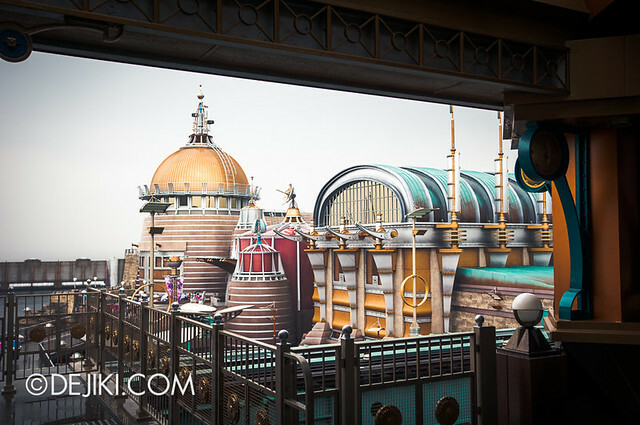 While there’s nothing much to do within the station, the waiting area and platform offers a very nice overview of Port Discovery. 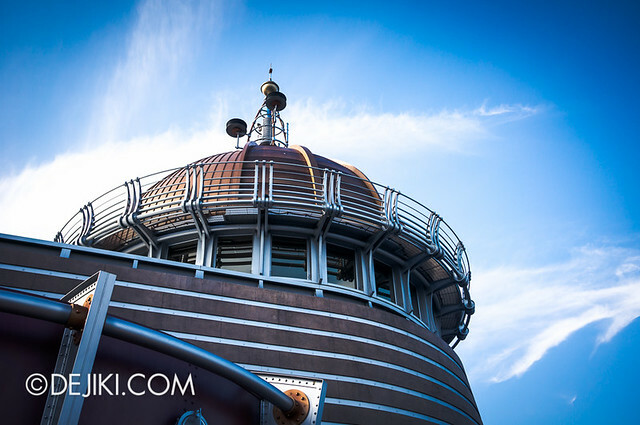 While waiting for the next train, admire the over-the-top, art deco futurist design of the station. 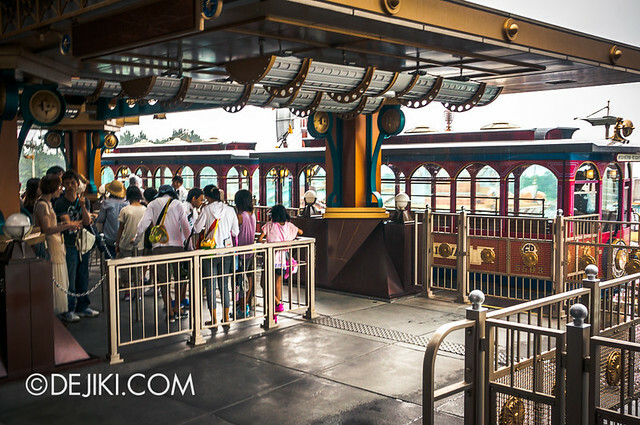 It’s just a simple transport ride but this station looks a lot better than the best rides at some other parks. 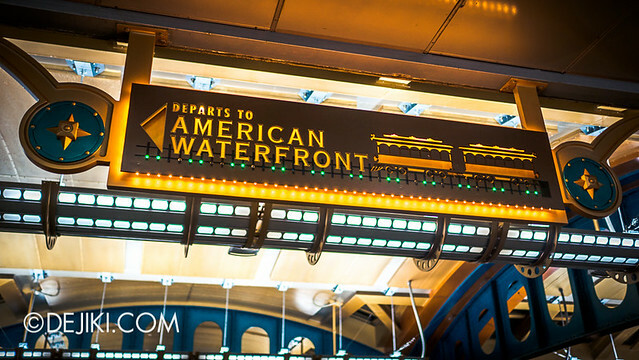 The rail leads back in time to American Waterfront, with the looming Hotel Hightower. There are 2 separate queues for it: one on the left and one on the right. 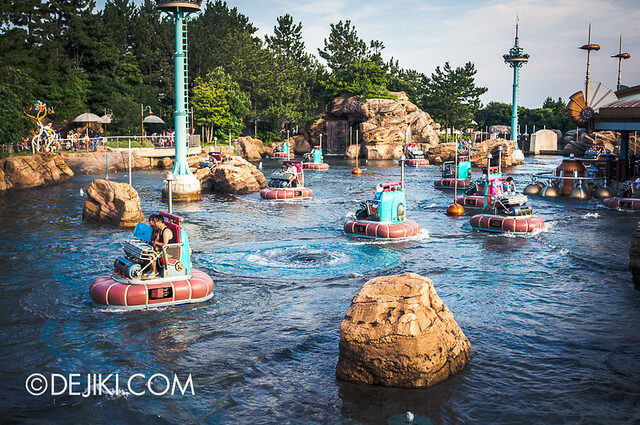 Both queues will experience roughly similar water obstacles including whirlpools and fountains. However, only one side will enable you to experience the cave, a small grotto with a waterfall cascading down. This can only be experienced when you queue on the RIGHT queue.